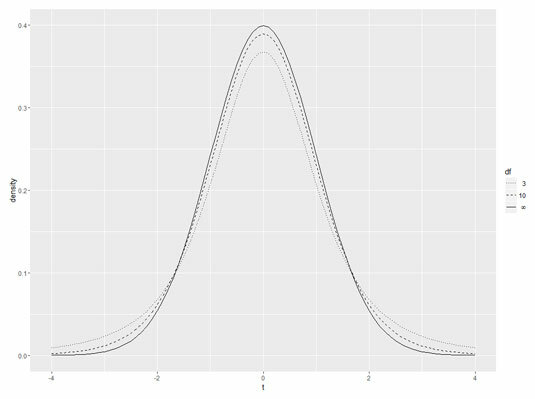 The grammar-of-graphics approach takes considerably more effort when plotting the values of a t-distribution than base R. But follow along and you’ll learn a lot about ggplot2. That’s a pretty good-looking data frame, but it’s in wide format. ggplot() prefers long format — which is the three columns of density-numbers stacked into a single column. To get to that format — it’s called reshaping the data — make sure you have the reshape2 package installed. Select its check box on the Packages tab and you’re ready to go. It’s always a good idea to have meaningful column names, so . . . The first argument is the data frame. The aesthetic mappings tell you that t is on the x-axis, density is on the y-axis, and the data falls into groups specified by the df variable. Geom functions can work with aesthetic mappings. The aesthetic mapping here maps df to the type of line. results in the following figure. One of the benefits of ggplot2 is that the code automatically produces a legend. 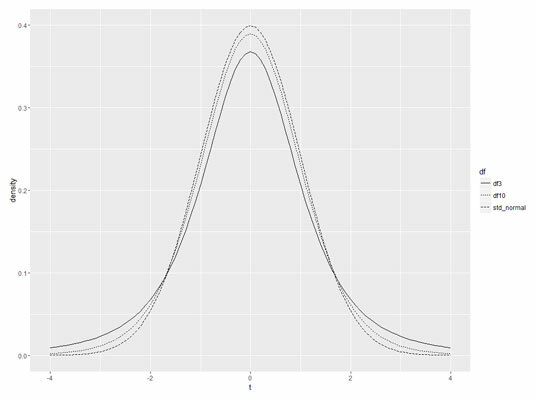 Three t-distribution curves, plotted in ggplot2. Three t-distribution curves, with the linetypes reassigned. Putting all the code together, finally, yields the following figure. The final product, with the legend rearranged. Base R graphics versus ggplot2: It’s like driving a car with a standard transmission versus driving with an automatic transmission!